03 0510 0858293 001 and labelling it February Event. Our artistic expression is drawn from our experiences, our identities and relationships with our communities, our ancestries, our histories, our spiritual place in the universe. Culture, as Haunani-Kay Trask argues, "...is political. Writing and music and painting and dance and canoe-sailing and kapa-making are political, as political as land ownership, medical care, universities, hazardous waste siting, and cultural hegemony. It is natural for the act and content of writing to be political. The unnatural thing is the American bourgeois insistence that authentic writing and authentic writers are apolitical. …My view of writing is in agreement with African American Nobel Laureate, Toni Morrison, who has recently reaffirmed that 'the best art is political' and that one 'ought to make it unquestioningly political and irrevocably beautiful at the same time.'" How do we walk the tightrope between expressing and engaging with the issues that move us and retaining the intrinsic beauty that our art forms demand? How as Toni Morrison and Trask create the best art - work that is 'unquestioningly political and irrevocably beautiful at the same time'? 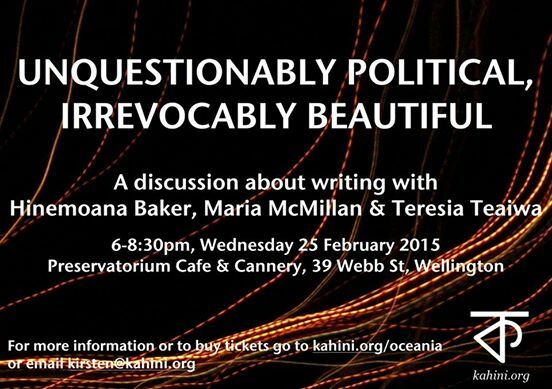 Join Hinemoana Baker, Teresia Teaiwa and Maria McMillan to discuss the question of how to write about who we are, where we stand and what moves us in our writing and our writing lives. Creating something is important to me. Maybe it's important to everyone. Because I have spent lots of emotional and intellectual energy over the years thinking about difficult stuff that's going on in the world, I've found poetry a way to not get too lost or sad about it all. Amidst destruction, there's an enormous and sustaining joy in building things that are all my own. It's like nose-thumbing at all the silencing and control that goes on. It's a rebellion and an answer of sorts to the things I hate. I believe writing needs to burn through to something. That's the reason I do it. To hopefully create a sense in the reader, and also in myself, that some kind of incandescence has occurred, illuminating the world, human beings, power, nature, history, the future, our mothers and fathers, our ancestors. It's a skillful writer who can do this without resorting to rhetoric, polemic or didacticism, though of course each of those has its place, too. Hinemoana Baker was born in 1968 in Christchurch, raised in Whakatāne and Nelson, and has lived for more than 20 years in Wellington and Kāpiti. She descends from the Ngāi Tahu tribe in the South Island, and from Ngāti Raukawa, Ngāti Toa and Te Āti Awa in the North Island. Both of her parents also have non-Māori heritage, from England and Bavaria. The author of three collections of poetry, Hinemoana has been the editor of the online journal of Whitireia New Zealand’s Creative Writing Programme (http://4thfloor.org.nz/), and co-edited the anthology Kaupapa: New Zealand Poets, World Issues (The Development Resource Center, 2007). She has performed and read internationally and has released five CDs of music and poetry. In 2009 she was the Arts Queensland Poet in Residence; in 2010 she was one of thirty-eight writers in residence at the University of Iowa International Writing Programme; and in 2014 she was writer in residence at Victoria University in Wellington. 'waha | mouth' (VUP, 2014) is Hinemoana's third collection of poems. Maria McMillan's mostly Scottish and English ancestors settled in Southland in the late nineteenth century. Maria was born and brought up in Ōtautahi / Christchurch. She grew up on the side of a hill with a view of the mountains and rooms full of books. Maria has been involved in campaigns on feminist, peace, poverty and other human rights issues. Maria is the author of two poetry collections: The Rope Walk published by Seraph Press and Tree Space published by Victoria University Press in 2014. In 2007 she co-edited Kaupapa: New Zealand poets, world issues with Hinemoana. Her poems have appeared internationally and locally including in Shenandoah, Magma Poetry, Sport and NZ Listener. Teresia Teaiwa is a poet and academic of Kiribati and African American heritage. She was born in Honolulu, raised in Fiji, and obtained her degrees at universities in the USA. She is currently living in New Zealand, and works as a Senior Lecturer in Pacific Studies at Victoria University of Wellington. Teresia has performed in venues across the Pacific as well as at the International Festival of Poetry in Medellín, Colombia, and as part of Poetry Parnassus at the London Olympiad. She was a founding member of the Niu Waves Writers' Collective in Suva, Fiji and is now working with students and members of the community to foster Voqa kei Seri: Fiji Writers in Wellington. Teresia's solo CD I can see Fiji: Poetry and Sounds (2008) was produced and sound designed by Hinemoana Baker. It has been described by literary scholar Ku'ualoha Ho'omanawanui as pushing ‘far past any preconceived boundaries of what constitutes Pacific literature’, ‘expansively universal and intimately personal, embodying a new kind of blossoming of two very traditional genres of Pacific artistic expression’.